In my many years as an artist I've heard a lot of complaints from artists about lack of appreciation. To a large extent I have little sympathy. My very first experience with public audiences, as opposed to friends and relatives, took place at an art festival in San Francisco about 40 years ago. As I watched people walk by the 2-3 works I'd gotten in the show I noticed that most people didn't even look. Those that did usually spent less than 10 seconds looking. When I got into my first juried show as a student at University of California at Berkeley the janitor yelled out in his memorable Portuguese accent that I'd better get my stuff out of the gallery if I didn't want it to "smell like horse****". Some disgruntled, or perhaps just avant-garde graduate students, decided to dump a load of horse manure in the gallery. They called it an Art Attack as I recall. When I got into my first serious juried show at the University of Rochester about 30 years ago I went to the opening with a friend of mine who'd also gotten in the show. I think he might have ended up winning a prize. Me? Both of my 4x6 foot abstract paintings were hung upside down! When I complained about this I was told that they couldn't fix it until after the opening, when of course the audience would decrease drastically. Between those experiences, a lot of knowledge of art history and the lives of artists, and perhaps a general skepticism I've come not to expect much in the way of appreciation. Even the best artists are often appreciated for the wrong reasons. So much as I'd like to sell more of my artwork and see more appreciation of it I fully believe that most artists are quite lucky to find even a few people who really appreciate their work. At some point of course truly appreciative buyers help I think to build an impetus toward sales to a broader audience that may buy less for appreciation than for cachet. Of course if it pays the bills I think most artists can live with that, especially if they know that they have some true fans. All of which leads to the thought that I almost never read anything in print that I think appreciates my work, especially something that is more than just a quick comment from generous peers. As I've said I don't really expect this, or wake up each day hoping to find it. I think this is in the nature of art, regardless of whether it is painting, writing, music, or whatever. But when it happens I'm surely not going to ignore it. 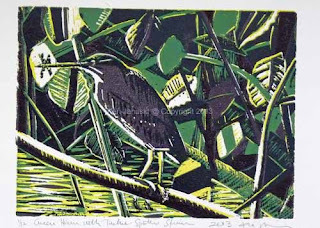 So this is all an extremely long lead-in to a note of thanks to Martha Knox for a wonderful review and appreciation of my reduction lino, Green Heron with Twelve-spotted Skimmer, shown at top. You can read the post on her blog Words on Woodcuts. Thank you Martha! The link above takes you directly to the post about my work. But I'd recommend looking at other posts as well as exploring all of her collected links. As an only occasional printmaker I often work in the dark. It's always to see the work of other printmakers. Martha has also written appreciations of other print works in separate posts. Eventually I hope to find the time to read more of them. Art criticism is the oddest thing. I was once asked if I had any interest in writing it. I said no, definitely not. The reason is that I'm a fairly critical person and it would make no sense, and I would take no enjoyment, in writing primarily negative articles. Writing an appreciation of an artist I admire is something else entirely though. It's fun to do, though not necessarily easy. I've only written a few such appeciations but when I do I enjoy it. I think what's most enjoyable is that I get a chance to try to share my excitement with the work with others. Sounds corny perhaps but it is true. And that is what Martha seems to do in the posts I've read so far about the work of others. I would heartily recommend taking a look at her blog, especially these appreciations. There was something wrong about the Pine Warbler that Jerene saw just in front of us in an apple along the edge of the Wissahickon. The yellow was mighty bright. AND there was that black line through the eye. Though this was a likely location for Pines there was no doubt that this was our first Blue-winged Warbler of the year. I did a quick sketch in the Moleskine sketchbook that I always carry in my backpocket. But I also wanted to get a color version. So I brought out my new Gamma 5.5x85 sketchbook from Stillman and Birn and inaugurated it with this sketch. This seemed only fitting after my demonstration of Stillman and Birn sketchbooks yesterday. The demo went very well, as far as I could tell, outside of a minuscule audience. But thanks to you who showed up. I hope you enjoyed it and learned something from it. I read once of a bird artist doing a second version of field sketches in the studio as soon as he possibly could. Perhaps it was Lars Jonsson but I can't say for sure. In either case it seems like a very good process. Draw the bird as accurately as you can in the field drawing only what you can see. Then elaborate on it on another sheet of paper back in the studio. It solidifies what you've seen but doesn't adulterate your initial impressions. Speaking of adulteration though this bird was brilliant yellow. Sometimes you just choose the wrong yellow when you go to render something. That's what happened here. And it's pretty sad given that the yellow was the most important part of the bird. Looks like it's time to add a new yellow to my palette! The rest of the day saw few warblers but many views of Pileated Woodpeckers. I can only guess why this normally shy woodpecker seems so visible now. It's looking for food for young or a female on nest. That's just a guess. Maybe it's just the lack of foliage. In any case it's nice to get so many views of them. It makes up for a 4-5 month drought. Common Whitetail Dragonfly. Pen and watercolor by Ken Januski. Well, first identified dragonfly I should say. We saw one very briefly about two weeks ago, but only long enough to see that it was a dragonfly. 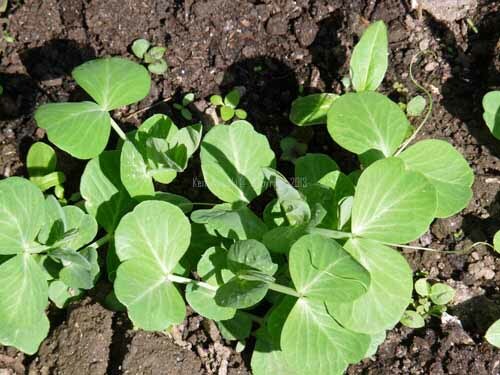 We couldn't begin to make a guess as to its identification. This one presented a similar but different problem. We could see it, in fact long enough to look in binoculars and take some photos. It only flew when I moved to try to get a different angle for a photo. On first glance neither I nor Jerene found it to be familiar. All the spots on the lower side of abdomen made us think it was one we'd never seen before, perhaps a particularly early flyer. But when I got home and looked at the photos I didn't really notice the pattern. Instead I noticed the thick, short abdomen. I imagine this is similar to books on birding that show birds of a similar color along with birds of similar species taxonomically. 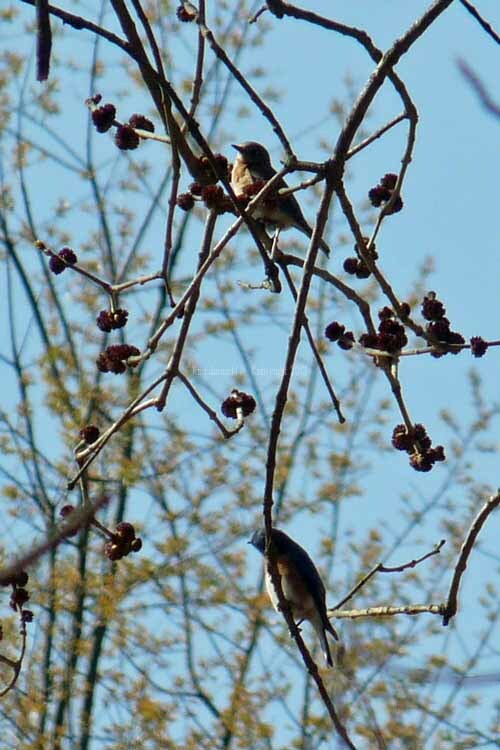 Often two birds will have a similar shape and they in fact are similar in terms of species, unlike birds of similar colors which may have little relation to one another. When I saw the abdomen I thought immediately of one of the few species I'm somewhat familiar with, about 10 species I might add. Common Whitetail. But where was the white tail? Some guides showed that the female or immature whitetail can have markings on the abdomen similar to this and don't in fact have a white tail. However they all showed strong markings on the wings, much like the adult male. These had no markings. So back to flipping through the guide books, all without success. 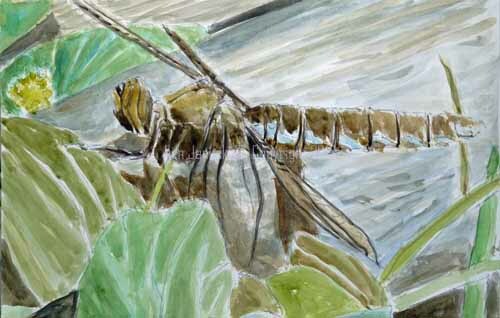 Finally I read about the species in Dennis Paulson's Dragonflies and Damselflies of the East. There I read that newly emerged dragonflies often lack wing markings! For me that more or less seals it. But there was one more thing. The photos showed a laterally striped head of ochre and brown. Sure enough that's what the photo in the Paulson book shows. So I decided it might make a good subject for my last new work before my Stillman and Birn sketchbook demo on Saturday. I've only done one work in the Epsilon sketchbook, which is specially designed for ink work. This is ballpoint pen with watercolor wash on a 7x10 page. As usual the pen worked fine. My excessive washes always buckle the paper a bit. But it will eventually dry flat. As I said I don't normally work in ink and watercolor. But I think the Epsilon sketchbook might work very well for those times when you want a detailed pen drawing with just a hint of color. For anyone who is interested in seeing the demo this Saturday there is also a discount on both Stillman and Birn sketchbooks and Caran d'Ache Neocolor II watersoluble crayons. See the notice on Stillman and Birn Facebook page. Once warblers arrive it's easy to convince myself that I ought to go out and look for them even if there are a million other things I should be doing. That happened yesterday. 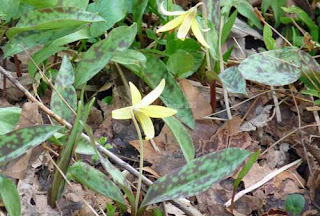 And of course, outside of three singing Louisiana Waterthrushes, they were nowhere to be seen. The highlight of the day was an Osprey sailing up and down the Wissahickon, calling in his full throated voice as he went. I say 'sailing' deliberately. The wind was so strong that he went by as though shot out of an arrow, twisting and turning with the curves of the stream itself. I brougth both my Moleskine and Stillman and Birn sketchbooks. As I said last post I'm in the habit of using the Moleskine for ballpoint pen field sketches. 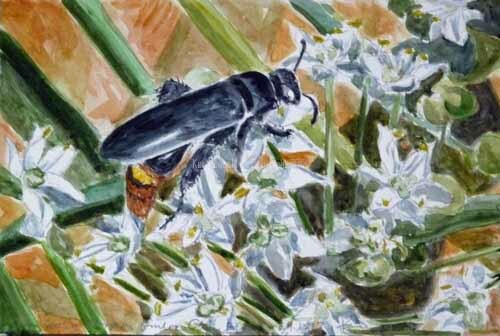 When I took up wildlife art I pretty much thought that's what defined a 'field sketch.' And to a large extent that's true. 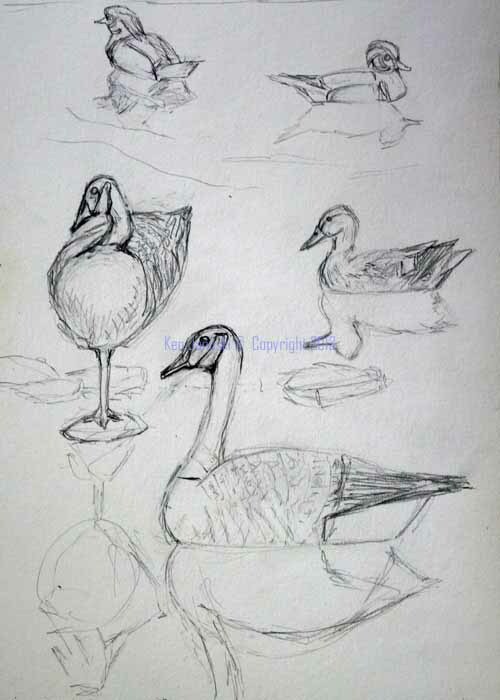 But I also found myself really admiring the more compositional sketches of a few wildlife artists, often done in the field as well. 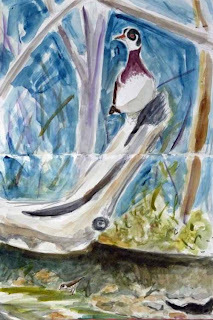 The problem with field sketches that just try to understand and portray the bird by itself is that they present a problem when used as the basis for a painting. How do you compose it? What goes in the background, the foreground? What are the colors, the light? That's something that more compositional studies can accomplish. I decided that this might be a very good use of the Stillman and Birn sketchbooks. So yesterday I brought along a small 5.5x8.5. Zeta sketchbook. It was hardbound so I knew that could open it and use it as one 8.5x11 sheet. Since I'd seen few birds along the way, and since there were up to 30 handsome Wood Ducks, all at Valley Green I decided to sit down on one of the benches and at least work up a pencil sketch. None of these birds ever appeared as they do in the sketch above. 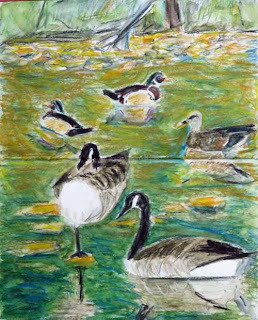 I started with the foreground Canada Goose, then moved on to two different Wood Ducks and placed them behind him, then added a distant goose to his left, Finally I added the female Mallard that floated by later. This type of compositional study is something that I greatly enjoy. In some ways it exemplifies the very center of art, especially natural art: creating something new out of things actually seen. It emphasizes creativity. I'm not saying that this is a great 'creation.' I did the pencil sketch on site and then added crayon and wash in my studio over the last two days. I thought I was finished last night but when I looked at the photo I'd taken I saw that all the values seemed to be the same. In particular I thought it would be better to make the foreground darker than the background. This is the type of compositional decision that I think involves another type of artistic creativity. The quintessential medium for this type of creativity is I think oil or acrylic, mainly because they allow endless variation, modification, fine-tuning. And that's the nature of the title of this post. I really do think that using these Caran d'Ache Neocolor II crayons allows as much flexibility and modification is as possible on a paper surface, outside of actually painting on paper. I think that's one thing I find so exciting about using them on the sturdy Stillman and Birn paper. I can get much closer to painting, and all the artistic fine-tuning that that implies, without actually using paint on canvas. So that's why I call this post 'Painting with Crayons.' This process gets very close to painting. And for me it gives me the chance to try out small paintings. In that sense this is a true sketchbook inthe original use of the term - a tool in which ideas can be tried out. I've often liked artists drawings more than their paintings. Rembrandt is a prime instance of this. They show the individuality, creativity, rawness of an artist without a lot of cleaning up to make presentable for the buying public. I think that's still pretty much true today. 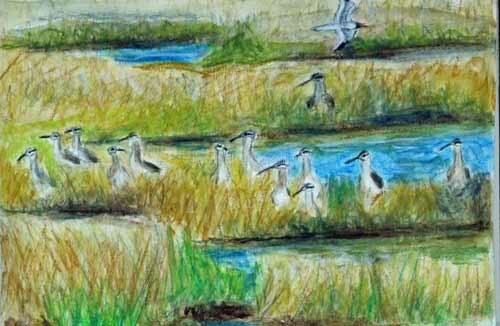 I often prefer the sketches of wildlife artists to their paintings. An exception I can think of right off is Bob Kuhn, mainly because his paintings don't have a high finish. They keep some of the raw power of sketches, and they make artistic composition as important as nature itself. It's the ease with which I can make artistic compostional and color decisions with the crayons and the Zeta sketchbook that make me so happy with them as working method for art. Finally I should add that I'd never make a finished painting based completely on the sketch above. There's too much that I'm unhapy with. But it is enough for me to picture a painting in my minds eye, and think about how I might change it to make an actual painting. That's incredibly valuable. After I'd posted this I realized that another version might be good for this Saturday's demo, listed at upper right of this page. I won't have time to do a drawing and use crayons to color it so I've been planning to have the sketch done in advance. This is a variation on the crayon sketch, but this time done with the benefit of reference photos. It's done on Stillman and Birn Delta paper, at a largish 9x12 size. Something I've mentioned before but is worth repeating is that this paper erases beautifully. It seems like migration has truly begun. Though we haven't seen hordes of birds over the last few days, especially this weekend, we have seen enough to make it feel as though spring and migration is truly here. 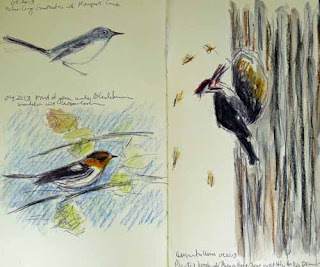 As is usual with warblers they don't sit around long for sketching. In fact they don't sit at all! The only bird drawn from life here is a Blue-gray Gnatcatcher and they're as flitty as any warbler. Still I did make this attempt yesterday. Later in the day we saw a Pileated Woodpecker excavating a hole. Every once in a while he would seem to rock back and forth into and out of the hole. When I put up my binoculars I realized that every few minutes when this rocking occured he was tossing out the wood that he'd just chiseled out. I didn't begin to try to draw it, though I did take some distant photos. This is done this afternoon strictly from memory. 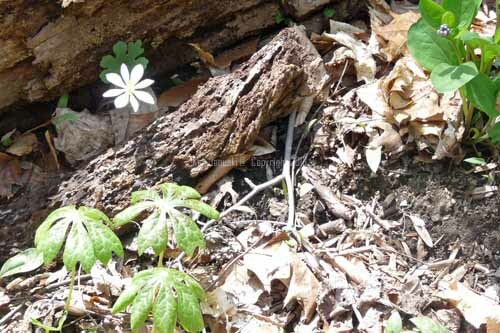 The biggest thrill of the weekend was a male Blackburnian along the Wissahickon today. 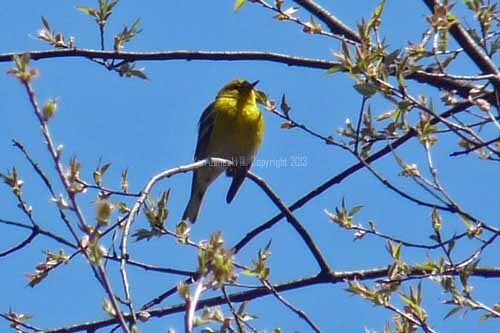 Most of the recent warblers, even the Louisiana Warblers, have been very high, either feeding or singing. 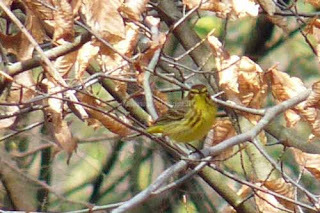 But this most beautiful of warblers perched at eye level just 10 feet away, but also for just about 10 seconds. Then he was gone for good. So this also is done from memory after I got home. 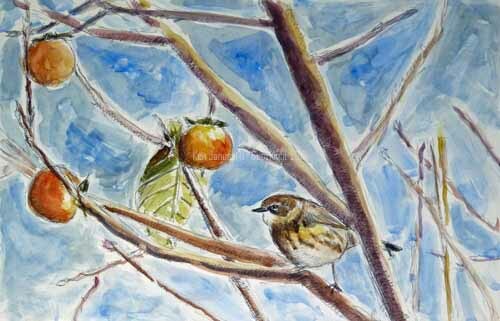 As I've said I've been experimenting with Stillman and Birn sketchbooks for my demo this Saturday. But my field sketches are generally done in ballpoint pen in a Moleskine sketchbook. That is what I used to draw the gnatcatcher so I decided to also use it for the other birds. After that I decided to experiment with adding color with the Caran d'Ache Neocolor II crayons and a waterbrush. I much prefer the Stillman and Birn for more developed work in color, especially with the Caran d'Ache crayons but it's nice to know that they can also be used to add a bit of color to the Moleskine field sketches. There was a tiime I couldn't imagine working from my memory hours later. I'm glad that I finally have enough experience that I'm at least not afraid to give it a try. Perhaps later I'll try something more developed combining the Blackburnian and one of the waterthrushes. P.S. Given all the birds I'm seeing recently I've found myself going back to Michael Warren's American Birding Sketchbook. I admire it more everytime I look at it, especially for incorporating bird and environment, something quite rare in most bird art. Wood Duck and Canada Geese in Wissahickon at Mt.Airy Bridge. 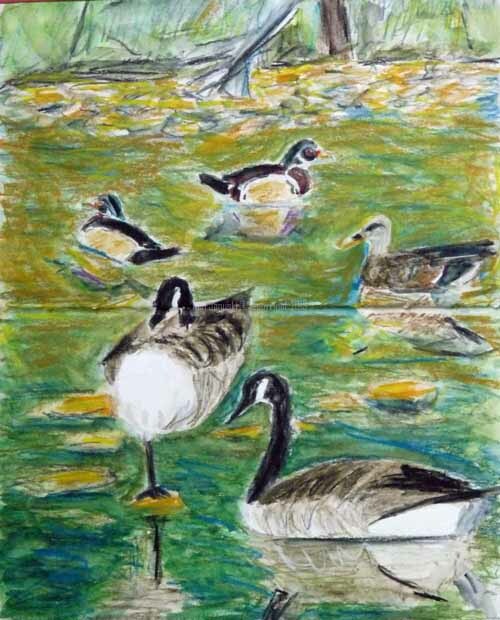 Crayon and wash by Ken Januski. OK. Enough of those photos! They do help with documentation but they always seem lacking in expressive power. As I said in another post the opportunity to try a bunch of Stillman and Birn sketchbooks for the demonstration on April 27 has gotten me to experiment with various subjects. In most cases I've looked at these subjects for awhile, knew that I'd like to do something with them, but just couldn't figure out how to go about it. For some reason this demo has spurred me on to try many of them. At top is a 7x10 watercolor on Stillman and Birn Beta paper. I used to collect and draw insects that I found, rendering them with a technical pen and viewing them under a microscope. It was a big switch from the 6x8 foot abstract paintings I was doing at the same time. In any case I came to see how fascinating insects were and spent a lot of time identifying what I saw. A year or so ago I took some photos of the wasp at top in our garden. It's a very familiar wasp. But my familiarity with insects has lapsed. I believe it's a scolid wasp. In any case I've always loved the combination of it and the garlic chive flowers in the photo. I've shied away from the whiter Stillman and Birn papers but I've seen some people, like Debbie Kasari at Drawing the Motmot use it to great advantage. So this seemed like a good paper for the brilliant whites of the garlic chive flowers. At bottom is another such photo, and scene - Yellow-rumped Warbler, with just a blush of orange, perched in the Persimmon trees at the dunes of 'The Meadows' at Cape May in the fall. The combination of orange colors, grays of the persimmon trunks, and often brilliant blue skies of October is a scene not to be forgotten. This is done on 7x10 Stillman and Birn Epsilon paper, a paper meant for line, especially ink line. It also is brilliant white like the Beta paper. I decided to render it with a ballpoint pen, then use a light watercolor wash over it. It worked well but I think would have been better off without the blue background. This isn't a style in which I normally work. But I think anyone who likes to combine ink and light wash will find this paper very desirable. Though I don't normally work this way I'm sure I'll try it again. It is truly amazing to realize what an arsenal of tools I'm building up. Finally amidst all of yesterday's photos I did try a new Stillman and Birn 5.5 x 8.5 inch Zeta sketchbook, doing a quick pencil sketch of a Wood Duck and two Canada Geese on a large rock in the Wissahickon. It's viewed from the Mt. Airy Bridge and yes that is my attempt to render it, in the splendid glory of Wissahickon Schist of which it's made, in the foreground. I had hoped to actually use the Caran d'Ache Neocolor II crayons on the spot but since time was limited. I added the color with the crayons and wash from various waterbrushes later in the day yesterday and this morning. Again I opened the sketchbook so that it was flat and used it as one whole sheet of paper. I've often seen this used very effectively and so I've wanted to experiment with it. The paper worked beautifully. But I think I just didn't make the best composition. On the other hand it's my first in the field use of this sketchbook. I see great possibilities in the future. 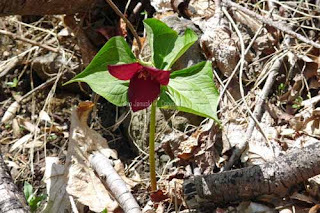 My friend Ellen at ﻿The Spicebush Blog reminded me in my last post that spring is still slow to arrive in some parts of the country. One of the best things about Philadelphia is its early spring. In any case even though I had no intention of showing or taking any more photos I couldn't resist trying to get photos of a singing Louisian Waterthrush today and I did want to show a couple of garden photos. 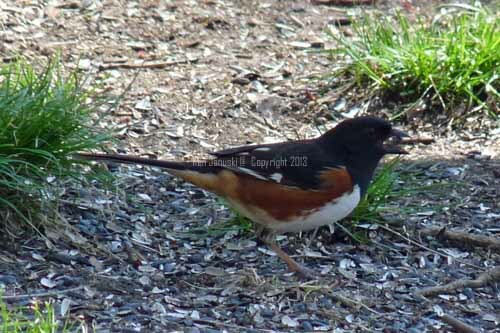 So this is segment number two of Spring Photos - 2013. It's specifically meant for those still awaiting true spring. It used to be that we would take birding trips, work very hard to hear and then if we were lucky see Louisiana Waterthrush. Then a few years ago I realized how easy it was to at least hear them along the Wissahickon, less than a mile from our house. I saw and heard the first two last week. Today I heard two more and after an hour's singing finally got a look at one high in a Sycamore. It is surprising how high they will go when they are singing early in the year. Along with him today I finally saw some first of year Yellow-rumped Warblers along with some more Palm Warblers and a Blue-gray Gnatcatcher. Later a 'kakaka' exploded in a tree less than six feet away from me. It was a Pileated Woodpecker just feet away. After hiding since December, or possibly just being gone from this area, I seem to see one or two everytime I go out now. Unfortunately the one photo I took is out of focus. 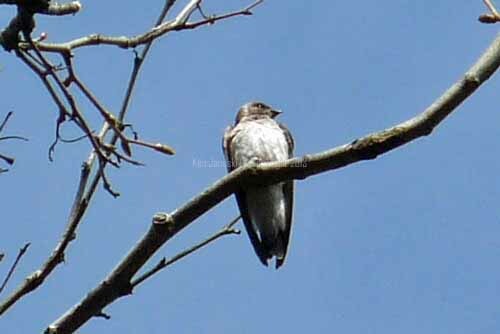 Also a photo of a relatively new bird, the Northern Rough-winged Swallow. The only new wildlflower was what I believe is Clintonia. There was quite a stand of them. But I'll need to wait until they bloom to know for sure. Finally some photos of our Oregon Giant Snow Peas, planted five weeks ago in the hopes that they'd germinate early and be ready by June so that I can replace them with beans or some other crop. And finally an Arugula from the garden. 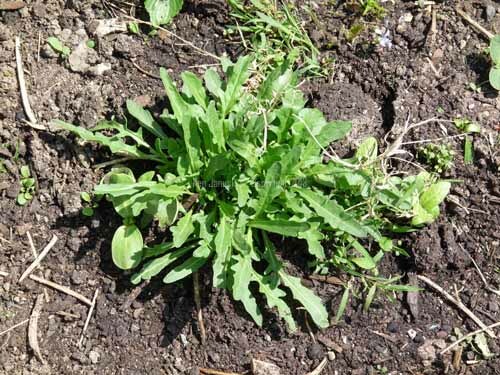 For the last few years our arugula has overwintered, as though it is a perennial. I'll still plant more but it's always nice to have some come through from the following year. And after the events of Boston yesterday it seems good to remember all that is beautiful and rewarding in the world. Spring in the woods, for those who pay attention, does just that. Though I've done more sketches and paintings over last few days it seems time for a break. 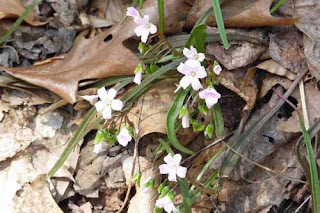 The last two days have brought us perfect spring weather, sunny but highs in the low 60s, with migrants appearing and wildflowers popping all over. Above are some photos I've taken over last two days. The one missing photo, a picture of the snow peas 2-3 inches high in the garden, and of course some of the migrants that just didn't cooperate such as the flitty Blue-gray Gnatcatcher. I much prefer to show sketches and paintings to photos but every once in awhile it seems worthwhile to document all that is around in photos. Back to sketches soon. Well yes, putting a zip line in the Wissahickon(see image at top right) ought to be a crime. You can read about it at Alliance for Preservation of the Wissahickon. But that's not what I'm writing about even though it's much on my mind. On a more positive note I'm thinking about how it ought to be a crime to have as much fun as you sometimes do when making art. All in all it balances out though. For all the fun there are plenty of struggles, both technical and inspirational. But sometimes you just have fun. That's been pretty much the case for me ever since I started experimenting with Stillman and Birn sketchbooks about three weeks ago in preparation for my demonstraton at Merion Repro and Art on April 27. It's especially been enjoyable because I've been using Caran d'Ache Neocolor II water soluble crayons. I know this may be getting to be a bit much. Just how much am I being paid to keep up these testimonials? Being a natural skeptic I understand where a reader might have doubts. But I am quite serious when I say how enjoyable it's been. Today's surprise, and yesterday's as well, was a Zeta sketchbook. A very heavy duty paper, made especially for mixed media and with a plate finish. It turns out that the plate finish is a pleasure to draw lines on. The pencil just sails along.The newest drawing of a Yellow-bellied Sapsucker began with a detailed pencil drawing. My intent, as in many of these, is to make more of a painting than a drawing, but they generally start with a lengthy drawing. I feel freer to take liberties with color and shape when I know I'm anchored by a solid drawing. I was curious as to whether or not I could on both sides of a piece of the Zeta paper without what was on one side affecting the other side. 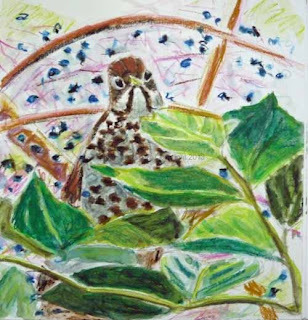 So after paintng the Wood Thrush yesterday I painted the Sapsucker on the other side of the same paper. Almost no warping at all, and certainly no bleed of the color from one side to another. I don't normally work this way but I figured it was a good experiment. Now you know. One problem I've always had with crayons is that they don't hold a point. I suppose they could be sharpened to a point in some way but I've never tried. But I don't really need to. Over the last few days I've discovered that I can touch a small wet waterbrush to the crayon itself and pick up some pigment. If the brush is small then I can make a small fine line in the same color as the crayon, almost like having a laser crayon sharpener. I've also never had much luck with waterbrushes. Three weeks of experimentation has taught me a lot though. So I now have a handy toolkit for working on live color sketches: my Stillman and Birn sketchbooks,my Caran d'Ache crayons and some waterbrushes. If the rain ever ends here I'll soon give them a try in the field. I believe that many people use such a setup for journaling, especially nature journaling. Long ago I realized that I wasn't a nature journalist. But I enjoy many who are. And I can see why many might find this sketching setup something they'd be happy with. Speaking of work and fun in art, I wasn't having fun when I saw that one of my Zeta sketchbooks was square. I've always thought it nearly impossible to work in that format. On the other hand I always like a challenge. In the end the square format turned out not to be a problem at all. Life is full of surprises. I apologize for the bad pun in the title of this post. I hadn't planned on it but was thinking about how what is portrayed here happened in the blink of an eye, my eye: I noticed a sleek black animal scurry along the Wissahickon in and out of the rocks at its edge. 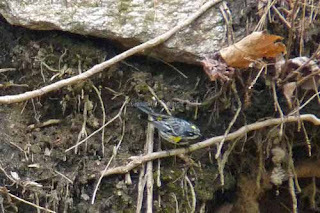 At the same time it scared up a first of year Louisana Waterthrush which was only about 6-12 feet away. It flew up and sang its song, the first time I've heard it in 2013. A bit further down the stream two Wood Ducks perched high in a sycamore, I'm sure having found a hole to nest in there. And of course when I thought about blink of an eye, I immediately thought of the mink. This is the third time I've seen this type of mammal slinking along the edge of the Wissahickon. My investigations made me think it was a mink but I just wasn't sure that they were in Philadelphia. A little online questioning convinced me that they were and that this is what I had seen. I always like seeing Wood Ducks in trees, or flying through trees. Though this is where they nest I see them at least 90 percent of the time on water. So it's nice to be surprised by them up high. 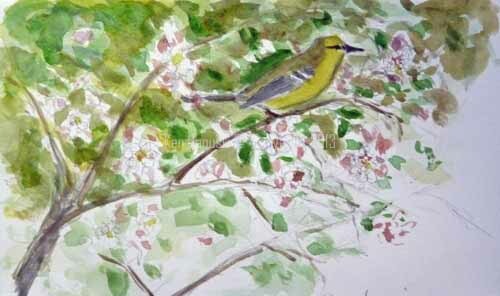 Though I like the idea of combining things seen into a paintng it often seems to daunting. How in the world do I show the Wood Duck high in the tree, the Mink and the Waterthrush without it seeming horribly contrived? Well that is where the arrival today of a box of Stillman and Birn sketchbooks to try out for a demonstration later this month comes in. In this case it was the 8.5 x 11 inch hardbound Alpha sketchbook that caught me eye. I knew that many people are in the habit of opening up a double spread and just working across the page division. I've wanted to try that myself. It also gave me an idea as to how to show the Wood Ducks and the other two subjects all at the same time. A tall vertical format seemed perfect for that. As usual this is more of an exploration than anything else. I've used far more water on the paper than is probably reasonable. But it held up just fine and allowed me to experiment with this somewhat complex composition. I'm very happy with this and assume that one of these days it will find its way into either a more developed painting or a print. 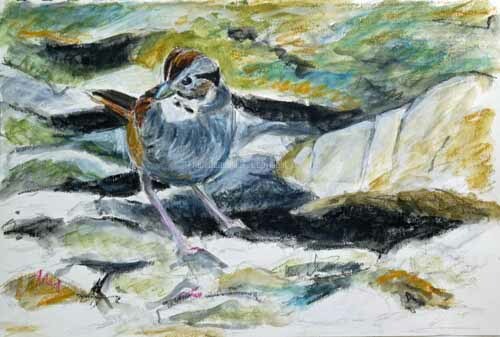 Swamp Sparrow in Papermill Run. Crayon and wash by Ken Januski. No, I'm not giving away any free paintings. 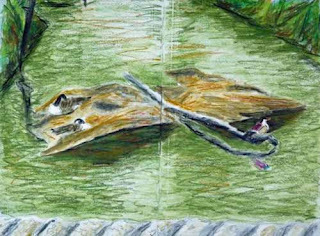 Instead I'm referring to the feeling I have when I've finished a Caran d'Ache Neocolor II water-soluble crayon sketch with wash on Stillman and Birn sketchbook pages. Used the way I'm using them they are actually more like small paintings than anything else. Best of all they allow more working, reworking, overworking than any other medium other than acrylic and/or oil. And I don't need to do it on canvas. I can use these small pieces of paper. For someone who's not an artist this may make little sense. The main problem is that, especially with watetcolor, you can't do to much experimenting. It's extremely difficult to put a light color over a dark color if you decide that the dark color doesn't work. Continued working turns the painting to mud. There's no brightness left. And you need to use good quality watercolor paper if you're going to keep working and reworking what's there. This combination of materials gets around that to a large extent because the Stillman and Birn papers are very hardy. And you can always go back into the painting with the crayons to bring back more brilliant color if things have gotten a bit muddy. The only thing that doesn't work is bringing back a brilliant white. For that you really need to resort to white gouache and even it may be a bit darker than I'd like. Still I've never seen a quicker or easier way for working through ideas for paintings. And as I've said before, if the sketch turns out well eough that you'd like to keep, frame or sell it, the quality of the paper allows you to do this without feeling guilty. I have done other sketches that I've always been reluctant to offer for sale because I wasn't sure how long the paper would hold up. By the way the birds portrayed are numerous Whimbrel and one Laughing Gull from Nummy Island in New Jersey and a Swamp Sparrow, always elegant in gray and chestnut, in Papermill Run at Morris Arboretum in Philadelphia. I'm still wating to see my first Swamper of 2013. 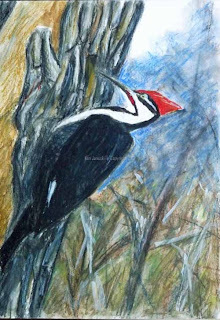 First Pileated Woodpecker of 2013. Crayon and watercolor by Ken Januski. Quite a few years ago we started going for walks on major holidays in the nearby (i.e. one mile away) Wissahickon Valley in Philadelphia. On one of those early walks, probably Christmas but possibly Thanksgiving, we saw a Pileated Woodpecker. Since then every cold weather holiday walk brings the hope of another. 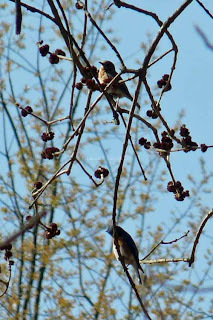 They do nest in this area and 9 of them were found in Philadelphia in the Philadelphia Mid-winter Bird Census of early January. Over the years we've gotten better at finding them, or perhaps and most likely we just bird more. In any case they've become less scarce to us though they're still not an every day or even every month occcurence. 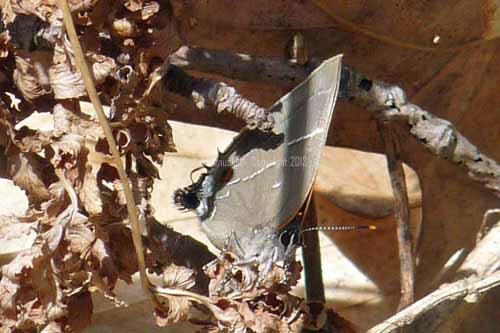 Still we'd seen them regularly at Andorra Natural Area towards the end of 2012. 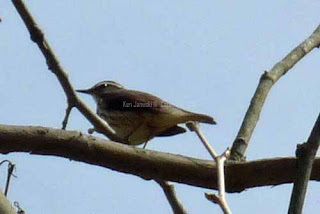 I thought we'd find one there early in 2013 and we could add it to our count of 2013 birds. But no. 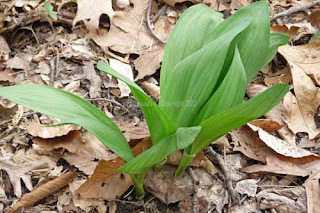 We didn't find one there or at any of the other nearby locations, including the Wissahickon Valley, where we often find them. Over the years I've gotten in the habit of keeping a count of the birds I see out on walks so that I can submit them to ebird. At first I used my own abbreviations for species. Then I discovered the codes used by banders in Richard Crossley's recent birding field guide. I didn't bother to memorize them but they often include the first letters of the words of a birds name, for instance PIWA for Pine Warbler. Of course there are overlaps and so not all the abbreviations work like that. 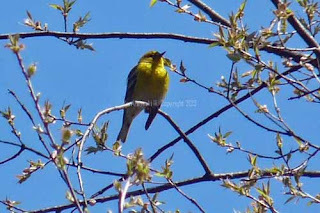 In any case yesterday I was particulary on the lookout for one of the earliest warblers to arrive in Philadelphia, the Pine Warbler, or PIWA. I checked some pine trees in the Wissahickon near the Walnut Lane Golf Course. No such luck. I heard one candidate but decided it was a Dark-eyed Junco. And it was so cold and windy that few birds were making themselves visible. Then I heard a nearby sound, a combination of squeal and cackle that I associate with Pileated Woodpeckers and Northern Flickers. I assumed it was a Northern Flicker. But then I saw all that black. 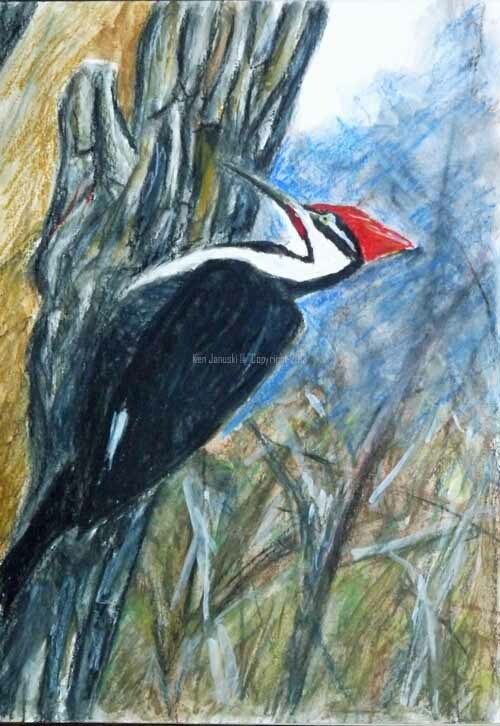 It was the first Pileated Woodpecker of 2013! I ended up doing one field sketch. Without a scope though I needed to put down my binoculars each time I tried to put down some marks on paper. With a scope I can look and draw at the same time. I decided I was just missing too much of the detail of the facial markings. So I then took some photos. 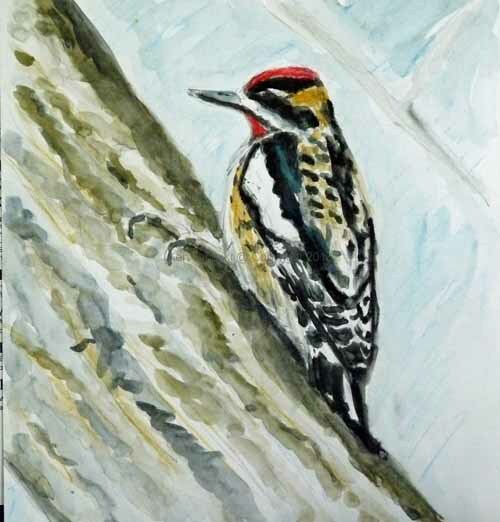 I wanted them so that I was clear about the facial markings and how they change as the woodpecker moves his head about. Above is another Caran d'Ache Neocolor II crayon drawing on Stillman and Birn Delta sketchbook paper (9x12 inches). Eventually I added a bit of white gouache. I also did this with two waterbrushes rather than just using my many watercolor brushes. I'm still having a hard time with them. They always seem to shut off the water supply just when I need it. But it seems like it's worth pursuing them just a bit more because they can be convenient when out in the field. So why did I mention the banding codes? Because I went searching for a FOY PIWA and found a FOY PIWO. There's much argument about the use of these codes, partially because they're hard to decipher for some, not all abbreviations are what you think they are, and the true names of birds are much more pleasant and resonant. Still once you get used to using them for their convenience it's easy to be amused by finding a First Of Year PIleated WOodpecker when you were searching for a First Of Year PIne WArbler. .